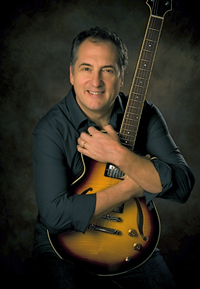 More than just a Jazz guitar player, Chuck Loeb is the consummate musician. In a career that spans four decades, he has proven himself to be a versatile composer, arranger and producer in a wide range of musical styles and contexts. In addition to crafting a fine discography of his own and producing albums for a number of other high-profile artists, his resume also includes music for commercial jingles and a variety of television programs and motion pictures. Whatever your personal tastes in music, media, entertainment or popular culture, chances are good that you’ve had at least a passing acquaintance with the work of Chuck Loeb. Loeb grew up in Nyack, NY, a suburb of New York City and the perfect environment for a young person with an interest in music. The area was home to many artists who worked in the city, as well as a center for many arts, music and performance education programs. It was there, at the young age of 11, that Loeb decided to make music his life’s work. Self taught for several years, he began working with local bands in the area when he was 13, playing dances at the local youth center and eventually throughout the metropolitan area. This early teenage period marked Loeb’s first exposure to Jazz, and he decided that in order to reach the level of technical kill he’d been striving for, he would need to study music formally. Along with local teachers Richie Hart and Hy White, he traveled as far as Philadelphia to study with Jazz guru Dennis Sandole, who eventually recommended that he study with the great Jazz guitarist Jim Hall in New York City. After studying with Hall for the last two years of high school, he enrolled at the Berklee College of Music in Boston. Two years of intense study at Berklee greatly strengthened his musicianship – not only as a guitarist but as a composer and arranger as well – but the lure of professional work led to his departure from Berklee in 1976. That same year, he left the suburbs and moved to New York City. Throughout his early years in the Big Apple, Loeb began making a name for himself as a sideman with Jazz luminaries such as drummer Chico Hamilton, Latin percussionist and bandleader Ray Barreto, flutist Hubert Laws and various others. He also continued his musical studies with a vengeance, often practicing up to eight hours a day. In 1979, Jazz luminary STAN GETZ invited Loeb to join his band. The gig proved to be a pivotal experience for him, both musically and personally. As a member of Getz’s group, and the composer of much of the band’s repertoire, he had the chance to tour the globe and perform at many of the world’s major festivals, Jazz clubs and concert halls. Eventually, Loeb became the musical director of the group with his compositions comprising a large portion of the nightly repertoire. It was also during this time that he met and married Carmen Cuesta, a vocalist and songwriter from Madrid, Spain. In the years since, Loeb has produced a number of Carmen’s solo recordings, and the two have collaborated on various musical projects. After leaving the Getz ensemble, Loeb resettled in New York and began to pursue a career as a studio musician. He logged thousands of studio hours recording, composing and producing albums, soundtracks, television show themes and jingles. It was here that he developed his talents as a producer, which would become a major focus of his career in later years. In 1985, Loeb joined the group STEPS AHEAD with Michael Brecker, Michael Mainieri, Peter Erskine and Victor Bailey. Returning to the festivals and stages of the Jazz world rekindled his desire to focus on his own music. In 1988, after nearly ten years of intense studio work, he made the decision to develop his own recording career. His first offering as a solo artist was My Shining Hour, released on Jazz City, a Japanese label. A year later, he released Magic Fingers on DMP, an audiophile label that was one of the first in the world to release recordings on compact disc. After four more releases on DMP, Loeb left to sign with the Jazz and world music label Shanachie, where he released The Music Inside in 1996 (the album’s title song held the number 1 position on the contemporary Jazz charts for six weeks). Concurrent with his solo career, Loeb also recorded with METRO, a four-piece contemporary Jazz combo that included keyboardist Mitch Forman, drummer Wolfgang Haffner and a succession of bassists: Anthony Jackson, Victor Bailey and Mel Brown. Metro has cut six albums on the Lipstick, Hip Bop and Marsis Jazz labels between 1994 and 2007. In addition, Loeb played with the FANTASY BAND with bassist John Lee, drummer Lionel Cordew and several session players. The FANTASY BAND recorded three albums on DMP and Shanachie between 1993 and 1997.